The Carlsbad Environmental Monitoring & Research Center is a division of the College of Engineering at New Mexico State University. The Environmental Chemistry Department run tests on samples to detect presence of heavy metals. The samples are received from a variety of sources like WIPP, NMSU, Carlsbad Community Gardens, and local communities from Carlsbad and Las Cruces. to learn more about Enviro nmental Chemistry click on the photo. As the disaster unfolded, 10,000 miles away, the Carlsbad Environmental Monitoring and Research Center, an independent environmental monitoring laboratory, began monitoring the air for radiation fallout. To know more about Fukishima radiation click on the picture. Visit our WIPP release event section by clicking on the picture. The Carlsbad Environmental Monitoring & Research Center is a division of the College of Engineering at New Mexico State University. 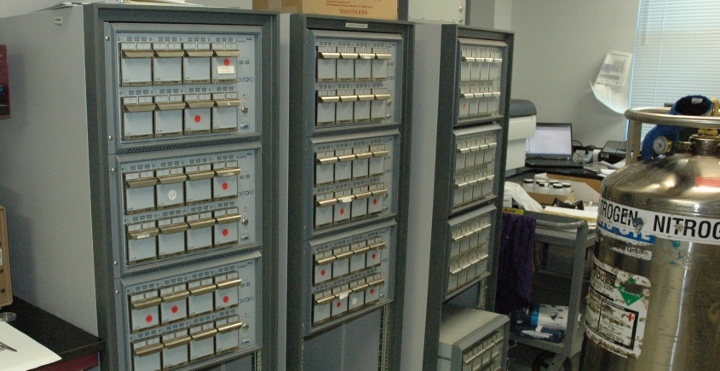 This 26,000 ft2 radiochemistry facility includes environmental and general radiochemistry laboratories, a special plutonium-uranium lab, an in vivo bioassay facility, mobile laboratories, computing operations and offices. The facility can perform a wide range of environmental and radiochemistry work, characterization, monitoring, and feasibility studies in support of performance assessment, radiological and environmental training and education, subsurface flow and transport experiments, nuclear energy issues, and issues involving Homeland Security particularly those involving radiation dispersal devices (RDDs or dirty bombs). CEMRC has partnered with Los Alamos National Laboratory (LANL), Sandia National Laboratory (SNL), and Nuclear waste Partnership, LLC (NWP) to create a unique facility with programs that include: environmental monitoring of almost any radiological and inorganic constituent; actinide chemistry and repository science particularly concerning the environmental behavior of Pu, Am, U and Np; dirty bomb mitigation research and training particularly for 137Cs and 60Co, head space gas and volatile organic compound (VOC) analyses; in vivo and in vitro bioassay, whole body dosimetry, military small arms range clean-up, evaluation and design of innovative treatment technologies, and soil, water, air and waste characterization. The Department of Energy Carlsbad Field Office (DOE CBFO) currently operates the Waste Isolation Pilot Plant (WIPP) near Carlsbad, New Mexico, as a repository site for transuranic (TRU) waste generated as part of the nuclear defense research and production activities of the federal government. The CEMRC facility and staff provide support to WIPP, LANL, SNL and NWP primarily through site and environmental monitoring, in vivo bioassay, and scientific and laboratory support.